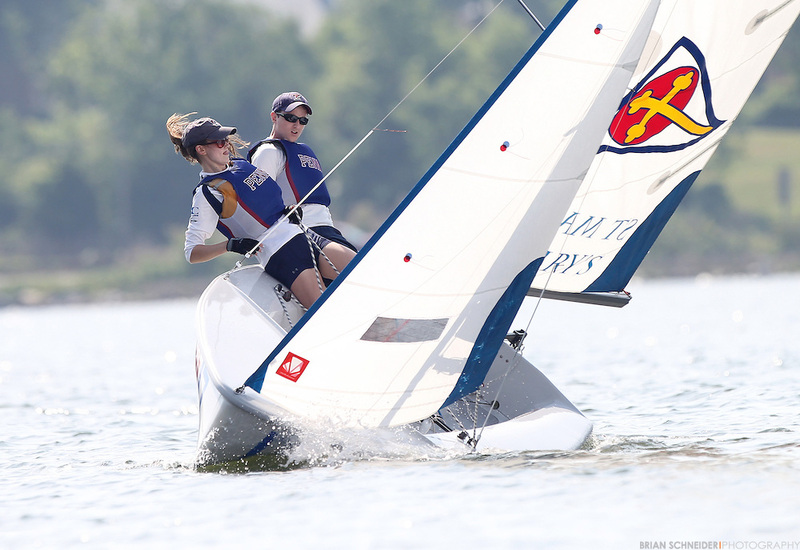 This weekend Penn competed in the Saint Mary’s Fall Intersectional, hosted at the sailing center in Saint Mary’s City, Maryland. 18 teams competed in Z420s and FJs over two days of fickle breeze. Jack Swikart (’15) and Catie Hopkins (’17) represented Penn in A Division, starting in FJs on Saturday, while Drew Gallagher (’18) and Patricia Andrade (’15) kicked off the weekend in the new Z420 fleet for B Division. The steep competition at this intersectional was a step up in difficulty from what Penn has faced so far this season. Sailors arrived at the sailing center on Saturday morning to glassy water and a dismally light forecast. Nonetheless, the Race Committee was able to complete four races in puffy breeze (1-6 knots) from an unusual land direction, the scores from which reflected the wind’s unpredictability. After an onshore postponement around midday, the sea breeze began to fill, in which Penn sailed one of their best sets of the regatta, leaving them in 9th place at the conclusion of the day. The forecast for Sunday was even less promising than the day before, and as expected, when sailors arrived on Sunday there was not a ripple to be found in the entire bay. An onshore postponement was not long in coming, and sailors changed gears to homework mode while they awaited a verdict. Luckily, the morning was hot enough to engender a sea breeze, which had completely filled by noon. Shifts were longer and less drastic than they were on Saturday and wind pressure was more or less consistent, which made for some close racing—one race in A Division saw the first twelve boats finish within seven seconds of each other. Despite the opposition, Jack came out of the gate in style, securing a bullet in the first race. Before the day was out, Penn competed in six intense races, over the course of which Drew’s scores slipped slightly from the previous day’s and Jack’s were improved. This weekend was definitely a learning experience—and a relatively successful one; Penn finished 11th out of 18 teams, narrowly beating out GW and Eckerd with a few crucial passes on the very last leg of the regatta. Next weekend we send a team to New York to compete in the Jesuit Open at Fordham and enjoy home field advantage for the Philly Fleet Race. This past weekend, Jack Swikart, Patricia Andrade, Cary Kane, Drew Gallagher, Keen Butcher and I traveled to Kings Point for our first big intersectional regatta of the season. Because the Nevins Trophy is a three division regatta, we were sailing all 3 of Kings Point’s fleets at the same time. While Jack and I started out in A Division FJs, Drew and Pati sailed the 420s in B Division, and Keen took charge of the C Division Lasers. The breeze was solid right off the bat, but cycling all morning, and Jack made the switch to Cary after the first race, only to switch me back in after another three races. Drew and Pati posted some solid races in the medium breeze, including a bullet right before the lunch break, and Keen was consistent all day. After lunch the breeze picked up considerably, leading to a tough afternoon for everyone, especially without our heavier crews for the big breeze. After fighting through gusts of about 20 for most of the afternoon races, we finished the day in 11th place overall. After a great diner dinner, we headed to bed ready for the next day. Sunday morning we awoke to humidity and no breeze, conditions that didn’t change once we got to King’s Point. After a bit of a wind delay on shore, we finally got out with the hopes of starting the first race around 11:00, but we floated around for another 45 minutes before the A division sequence started (in which time I learned how to sail a Laser and Keen learned how to crew). The bit of breeze held just long enough for each division to get one more race off. We all posted pretty solid midfleet finishes before the fleet started sailing back towards the docks. We officially went into onshore postponement shortly thereafter, and then to the end of the regatta about an hour later- a typical Kings Point Sunday. We ended the weekend in 11th place out of 20 very competitive teams – a great start for our season. On the whole, we had a great weekend and showed a lot of promise for the coming season, definitely learning a lot about what work we have ahead of us for this fall. Many thanks to the Gallagher family for hosting us this weekend! For the first time in many years (maybe ever, we’re actually not sure), Penn did not need to send its top two skippers to the MAISA Central Fall Qualifier. This is a testament to the depth of the Quaker squad and a sign of the program getting closer to the level of programs such as Navy and Georgetown, which also enjoy the luxury of being able to send their top teams to intersectionals instead of their fall qualifier. 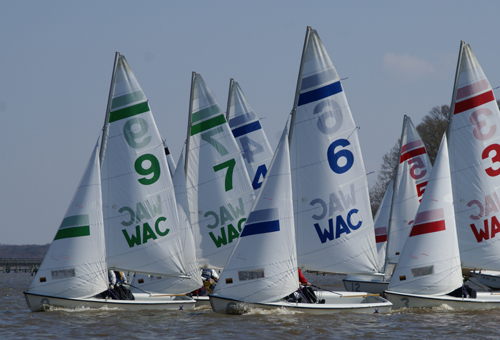 Skippers Joe Farned and Caroline Garth made the trip down to Washington College (known as WAC) for the qualifier, along with crews Carolyn Kearney, Meaghan Harding, and Audrey Harnagel. While the conditions were light, fluky, and unpredictable, the Quakers put on a great performance by finishing 4th, behind host Washington College, MAISA Central powerhouse Navy, and visiting MAISA South team St. Mary’s. This qualified Penn for their conference championship, the War Memorial, along with WAC, Navy, and Villanova, who earned the 4th Central berth to the event. Thank you very much to the Harding family for hosting the team for the weekend! 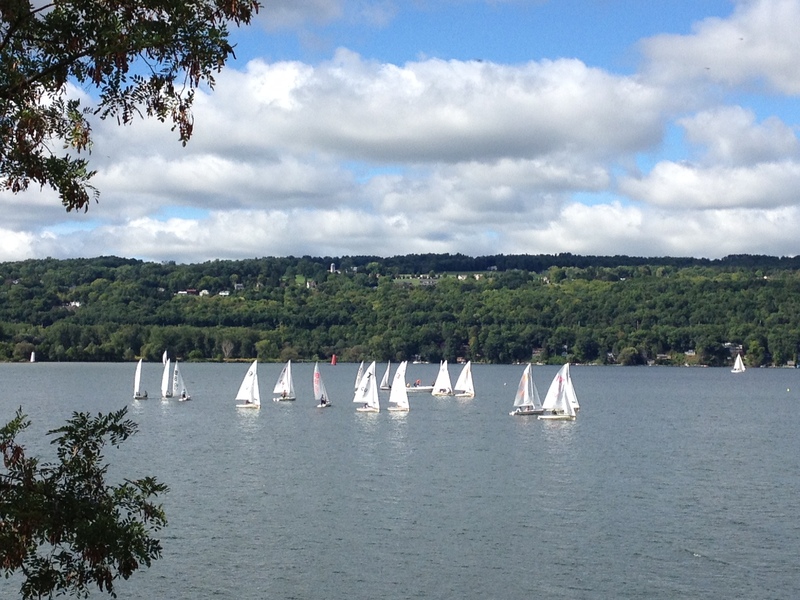 This weekend Penn competed in the Cornell Fall Open hosted at the sailing center on Cayuga Lake, just north of Ithaca New York. With a fleet of 18 420s we were in a rotations all weekend with A Division sailed by Drew Gallagher (C’18) and B Division skipper Carolyn Kearney (C’18) starting with Jack Swikart (C’15) relieving her. The crews for the weekend were Foster Collins (C’16) and Cary Kane (C’17). The regatta offered a choice opportunity for the new recruits (Drew and Carolyn) to get used to sailing at the college level in a low pressure environment, in preparation for the coming season. Saturday started as a cold and rainy morning with temperatures in the low 50s and light shifty conditions. Drew and Cary started in A, with Carolyn and Foster in B. Results were solidly in the top 10 for the day even though the conditions were tough. The lake provided a challenging venue because of the localized shifts and puffs that allowed a select few boats to sail away with the race. After the second set, Jack, who had thus far been the acting coach for this regatta stepped in to B to get some practice in 420s with Cary (who was switched from A) to get some practice together ahead of Sunday’s dismal forecast. By the beginning of the A set, the breeze had shifted by about 180 degrees and increased to over 20 kts, which worked in favor of the A crew switch, with Drew and Foster hiking their way to a well-earned 2nd in the first race. Unfortunately racing was called for the evening after only a single A race. Sunday morning started after Jack’s gleeful trip through Tim Hortons (a Canadian donut chain with clearly superior donut holes). In contrast to the day before, Sunday’s weather was beautiful with skies clearing around noon. Luckily the forecast was not as bad as first thought, and we were able to get 6 rotations with only a few light air races. The day went well for A with the heavy pair of Drew and Foster finishing with top tens, all the while learning the dos and don’ts of college sailing. Carolyn and Cary had a great first set in B coming out of the gate with a bullet in their first race of the day. Jack switched in to B Division again to give Carolyn some much-needed rest, and ran away with the last 4 races with bullets across the last two sets. Next weekend is all hands of deck as we send out two full squads to Nevins Trophy and Central Fall Qualifiers!